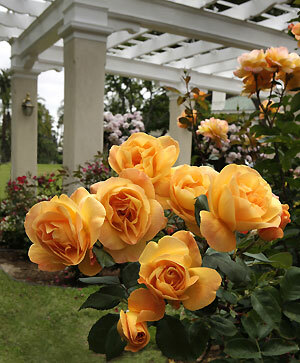 Few cities conjure the thought of roses more than Pasadena. 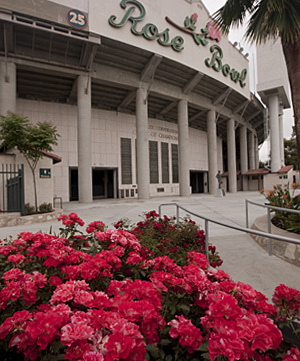 Rose Parade, Rose Bowl, but what about the Rose House? 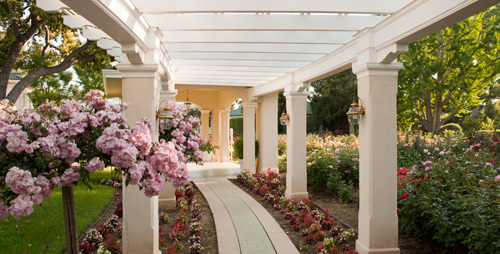 Built over a century ago, the Tournament House is the official headquarters of the Tournament of Roses Association. Standing three stories with over 18,000 square feet of interior space, the building has 22 rooms, all busy well before January 1st each year, with volunteers who make the New Year's Day events work. Presented to the City of Pasadena by the Wrigley family in 1958, the Tournament House and surrounding garden set the scene for Tournament events including annual announcements for the Grand Marshal, Rose Queen and the Royal Court. The house was purchased by chewing gum mogul William Wrigley Jr. in 1914 for $170,000. He obtained the adjacent property the next year allowing for a four and a half acre garden space. The location allowed the Wrigleys to watch the parade from their front yard. 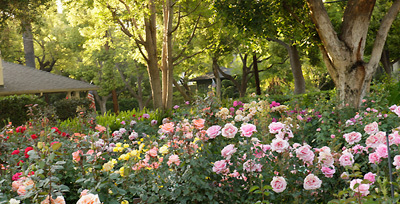 The Wrigley Gardens feature over 2,000 roses growing in the extremely rose-friendly environment of sunny, Southern California. Tasked with maintaining the garden for over twenty five years, the Pacific Rose Society meets each week, early in the morning, to keep the plants in top shape. Pruning takes place shortly after the New Year's Day festivities each year. The Pacific Rose Society was founded in 1937 and hosts several events during the year. As you stroll the gardens you will find several varieties of Weeks Roses. Burgundy-red and white striped Scentimental, an All-America Rose Selection (AARS) winner, will greet you with a strong, sweet spice scent. A potent, potpourri maker with old-fashioned style yet modern looks, Scentimental will definitely make memories in any garden. Another AARS recipient, Strike It Rich is featured in the garden as well. This highly fragrant grandiflora is a gold mine of color. The long-lasting flowers of yellow-orange hues stand out in front of dark green leaves and unique red stems. The garden isn't just about roses, camellias and other annuals partner with the roses in complimentary and contrasting colors. Arbors and trellises cover walkways leading visitors to incredible sights during the long growing season. Rose trees float above colorful annuals, creating layers around the grounds. Other Weeks Roses you are likely to encounter include the showy shrub Be-Bop. Hydrangea-like clusters of cerise flowers feature a yellow eye as a lively contrast. With natural resistance to disease, Be-Bop loves all landscapes. Another shrub with great color is Outta the Blue. Its tones ranging from magenta to lavender-blue, an ever-changing show of color fills the garden with clusters of old-fashioned flowers. The garden is open to visitors and there is no charge. Tours of the Tournament House are also available from February through August. After this the area is bustling with activity with nearly 1,000 volunteers as they prepare for the New Year's festivals. For details visit both the Pasadena Tournament of Roses and the Pacific Rose Society Web sites.